Nokia Lumia 930, the high-end Windows Phone 8.1 smartphone that went official in April this year, is now available for purchase in Ireland too, via Carphone Warehouse. Last week, the smartphone emerged at various retailers and wireless carriers in the UK, but it seems that users in more markets can actually acquire the phone. 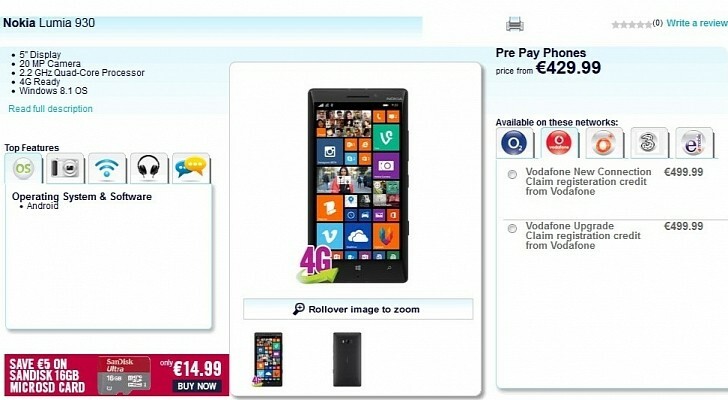 Carphone Warehouse is one of the retailers to have released the mobile phone in the UK, and the company is now offering it in Ireland as well, NokiaNewsIreland ( http://nokianewsireland.com/2014/07/20/the-nokia-lumia-930-now-on-sale-at-the-carphoneie-nokia-ireland-cpw/ ) has found out. The smartphone can be purchased on monthly plans on the networks of wireless carriers such as Vodafone, Meteor, and eMobile. Lumia 930 features a price tag of €429.99 ($581) with Meteor and eMobile contracts, while being priced at €499.99 ($676) at Vodafone. Those of you interested in the purchase of a Nokia Lumia 930 in Ireland should head over to this page on the retailer’s website to learn more on its availability. One thing that you should keep in mind, however, is that this handset runs under the Windows Phone 8.1 operating system and not under Android, as the retailer claims. Undoubtedly, they will update the listing soon to correct that error. As mentioned above, Nokia Lumia 930 was made official in April this year as the first flagship handset running under the new flavor of Microsoft’s mobile operating system. The mobile phone arrives on shelves with a 5-inch touchscreen display capable of delivering a full HD resolution and is powered by a 2.2GHz quad-core Snapdragon 800 processor. Moreover, the Windows Phone 8.1 device sports 2GB of RAM, along with 32GB of internal memory. Unfortunately, no microSD memory card slot is available for expansion purposes, although the phone does come with free OneDrive storage. What Lumia 930 does offer, however, is high-end imaging capabilities, courtesy of a 20-megapixel rear camera with full HD video recording and Surround-Sound, paired with a front camera for making video calls while on the go. It also features 4G LTE connectivity, along with 3G, Wi-Fi, Bluetooth and NFC capabilities, and a GPS receiver. On top of that, it comes with all of the features and capabilities that Windows Phone 8.1 was announced with. “The Nokia Lumia 930 comes with the latest Windows Phone experience, so the things that matter most are always with you whether you’re on your smartphone, Xbox or PC,” the retailer notes on its website.